WebLux Review 2019: Is WebLux a Good Hosting? WebLux is typical of a web design consultancy that can create a website and host it for you. It’s not like the big players that provide standalone hosting packages backed by superior support. Moldovan-Russian company WebLux was established in 2009 to provide expert solutions for web design, web development, SEO, and e-commerce to small and large businesses. As something of a sideline, the company offers web hosting and domain registration services. In addition to its local customers, WebLux serves customers in Germany, the U.K., the Netherlands, and the U.S. Its website is available in English, Russian, and Romanian. WebLux prides itself on providing top-quality web design solutions, but (in my opinion) the company can’t be as proud of its web hosting services that are limited to shared hosting and domain registration. WebLux has a data center in Germany that allows you to host 1-3 websites depending on your subscription. You can also get from 500 MB to 1 GB disk storage for your website, and 750 MB to 1 GB email storage for 3-10 email accounts. All hosting accounts use the Plesk control panel. Although I personally prefer the performance of cPanel over Plesk, the provided control panel’s user-friendly interface makes it still a good option for non-tech-savvy users. 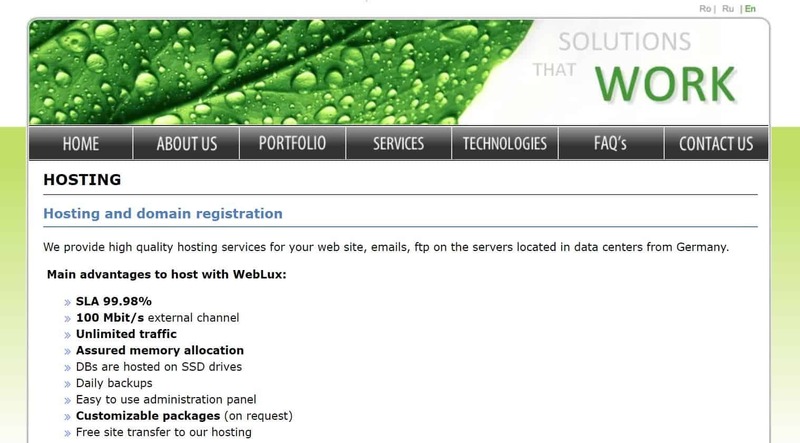 WebLux offers three web hosting packages: WEB, Solution, and Lux. The Solution and Lux plans support both Linux/PHP/MySQL and Windows/Microsoft SQL whereas the WEB package only supports Linux/PHP/MySQL. Although annual hosting prices are shown on the WebLux website, you are invited to “please email us or submit your request through our online quote form” to get a price quote. For website design/development, you pay an initial deposit followed by the balance once your website is up-and-running. And you get a one-year warranty on your website. Since the FAQ section is quite limited, the fastest way to get accurate support responses seems to be by telephone. WebLux is typical of a web design and development consultancy that incidentally offers web hosting services mainly (if not exclusively) for the websites it designs. 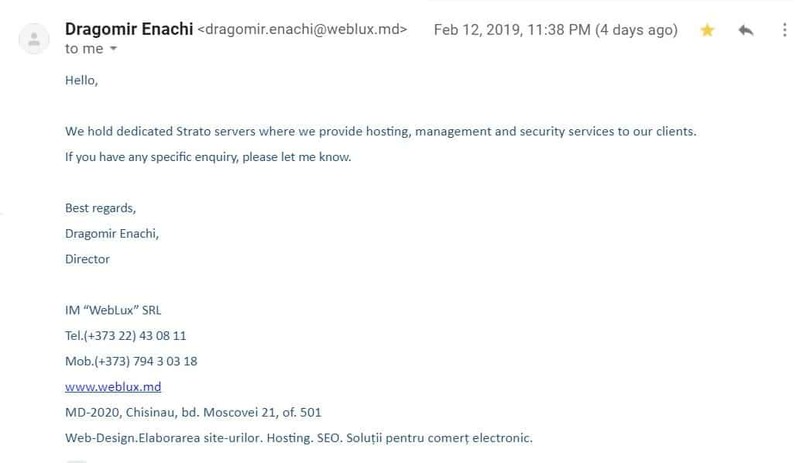 If you’re looking for standalone shared hosting from a prominent provider with superior support, you should probably be looking somewhere else. Let WebLux! create and host your website. Wondering how WebLux stacks up against other Web Hosting companies? Enter any other Web Hosting company and we will give you a side-by-side comparison.